The Yamalube Yamaha Official Rally Team proved to be a force to be reckoned with during this year's Dakar Rally. With team member Adrien Van Beveren winning the rally's final stage while locked in a fierce battle for an overall podium result, together with Yamaha France supported stage one winner Xavier de Soultrait Yamaha Racing riders remained strong contenders for top honours throughout the 39th edition of the prestigious annual event. Living up to everyone's expectations as possibly the toughest event that has ever taken place in South America, the 2017 Dakar Rally tested competitors' physical and mental stamina all the way to the finish line in Buenos Aires. Featuring a week's racing in the high altitude of the Bolivian uplands, weather conditions ranging from torrential rain to scorching heat the 8,818km adventure proved to be an extremely tough challenge for all competitors and team crews. Yamalube Yamaha Official Rally Team's Adrien Van Beveren was Yamaha's best performing rider at the end of this grueling two-week-long race through Paraguay, Bolivia and Argentina. Demonstrating the potential of his WR450F Rally machine the Frenchman climbed to third in the overall standings on stage five of the rally, holding on to his position inside the top three for the following four stages. Involved in a fierce battle for the final podium all the way until the last stage, Van Beveren eventually claimed fourth overall just 48 seconds behind third placed Gerard Farrés. For Adrien's Yamalube Yamaha Official Rally Team partner Hélder Rodrigues, this was the 11th time the Portuguese rider successfully reached the finish line of the Dakar Rally and the 10th time he managed to claim a spot inside the top 10 of the final overall standings. Struggling to find a competitive pace during the opening stages of the event, Hélder remained focused on his goal to finish the rally while also providing vital assistance to his teammate Van Beveren whenever needed. Enjoying a strong start to their two-week-long adventure in South America, Yamalube Yamaha Official Rally Team's Rodney Faggotter and Alessandro Botturi were unable to reach the finish. Claiming a 10th place result on stage two, Faggotter was holding on to a strong 14th place in the provisional overall standings before a minor technical issue forced him out of the race two stages later. As for Botturi, the Italian rider suffered a fall 30km before the finish of stage four and was unable to continue his race to Buenos Aires. Assigned with the task of developing a rally kit that will be available for all Yamaha riders within the next few months, Xavier de Soultrait demonstrated in the best possible way the vast potential of largely standard WR450F machinery. The Yamaha France supported rider kicked off the rally posting the fastest time during the opening stage's short timed special and then went on to claim two more top three stage results. Battling for the top five throughout the rally, a near disastrous stage 11 resulted in the Frenchman disappointingly failing to place inside the top 10. 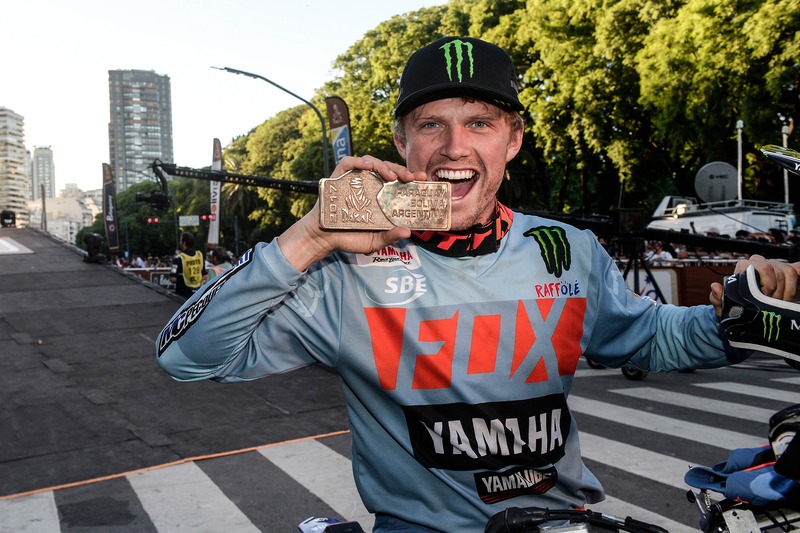 Together with the trio of Van Beveren, Rodrigues and de Soultrait, Yamaha was happy to see a total of nine more 'blue' riders reach the finish of this year's Dakar Rally in Buenos Aires. From Yamaha Spain supported Marc Solà Terradellas, who battled to an impressive 29th place in the overall standings, to Italy's Manuel Lucchese who claimed fifth in the unassisted Malles Moto class, all Yamaha riders helped reinforce the brand's presence in the prestigious annual event. Demonstrating the brand's dominance in the Quad class, Yamaha mounted riders occupied the first six spots in the final overall standings of the 2017 edition of the rally. With Raptor 700R mounted Sergey Karyakin claiming an impressive victory, 68% of all finishers in the Quad class of the 2017 Dakar Rally were aboard Yamaha machinery. "I would like to sincerely congratulate all the Yamaha Team. This Dakar Rally has been emotional, tough, unpredictable and both physically and logistically demanding. Well-done to Adrien van Beveren, who took the challenge and managed to step up his game improving his sixth-place result from 2016 to fourth this year, winning one stage on his way to the finish. Bravo to Xavier de Soultrait, who has enflamed the rally with a brilliant start to the event, being the fastest on stage one and proving his skills to finish every day with the top riders, aboard a motorcycle that all Yamaha customers will be able to purchase this year. A big thank you to Hélder Rodrigues who kept improving his pace despite the tough conditions. He was always there to help his teammates and finished another Dakar inside the top 10." "It's been a long two weeks and I'd like to personally express my gratitude to all team mechanics and support crews, and especially to Guillaume Davion, Rodolphe Beau, Pacal Ponce, Jordi Arcarons, José Leloir and Alexandre Kowalski who managed, motivated and supported the riders in a great sporting spirit, bringing them with full dedication to the finish line. I also have a very special and grateful thought for Alessandro Botturi and Rodney Fagotter, who had a good race pace but unfortunately were not able to finish. Finally, I would like to thank and congratulate all 'private' riders, who trusted Yamaha to achieve their sportive goals finishing the 2017 edition of the Dakar Rally. Well-done to M. Solà, F. Mota, M. Lucchese, R. Oliveira, S. Kazama, JJ. Garcia, F. Picco, G. Chollet and O. Hembert." "And I couldn't forget to congratulate and thank our Quad riders, who brought the brand in the six first places in the final rankings, with S. Karyakin, I. Casale, P. Copetti, R. Sonik, A. Dutrie (on a 450) and B. Da Costa. With a special thought to Camelia LIparoti who finished first in the women's class and 13th in the general standings. And last but certainly not least, thanks to all the Yamaha finishers N. Galeano, A. Giroud, Z. Tuma, C. Verza, D. Licio, G. Pando, L. Creatore and P. Rios. It was a big and successful adventure for Yamaha. We were highly competitive throughout the event, won two days and consistently battled for top honours in every stage. We are looking forward to seeing you all again next year." "The Dakar Rally entered a new era this year and Yamaha was there to battle for the top. Compared to any previous Dakar that has taken place in South America since 2009, this edition was heavily based on navigation. Of course, it had its super long stages, cold and warm days and a lot of altitude changes, but the main difference was that any small navigational mistake would cost a lot of time. This year we were blessed to have five exceptional riders who blended together with our mechanics and crew to create a solid team that continued fighting together until the end. We successfully battled through long days, bad weather and exhaustion to see Adrien and Hélder both finish inside the top 10 in the overall standings. As for Xavier, he surprised us all with his performance this year. Testing a special rally kit on his stock WR450F, Xavier went head to head with the international elite showing he has what it takes to be up front. It was a highly successful first step and we will continue developing this kit that all Yamaha customers will be able to purchase soon. From my part, I'd like to warmly thank all Yamaha riders and teams for their hard work and dedication. This Dakar Rally has been quite an adventure for everybody and we're already looking forward to the next one."